Following Kell Brook capturing the IBF Title from Shawn Porter, the landscape in the Welterweight division has changed slightly. The Welterweight division is one of the original weight divisions in boxing and has always had a sense of prestige matched only by the Heavyweight division. Perhaps this is because the greatest boxers of all time, Sugar Ray Robinson was at his best at Welterweight, but no matter fights in this division carry an amount of glamour. The current Welterweight division has had the spotlight thrust upon it more so in recent years as the two biggest stars of this generation have campaigned almost exclusively at the weight in Floyd Mayweather and Manny Pacquiao, as well as some exciting talent coming through alongside the top talents from the deep Light-Welterweight division moving up or indicating they would be moving up soon. With the possible thawing in the Cold War, the possibilities are opening up even more giving the chance for fan friendly fights to be made involving fighters from both Top Rank and Golden Boy, so it seems like a good time to look ahead to realistic fights that can be made in the division. House fights will still be easier to make, especially with those signed to Al Haymon but bridges have been built in some sense. Mayweather v Pacquiao may still be a pipedream so for the cases of this article will not be mentioned going forward but other fresh fights will be talked about. 1) Shawn Porter v Marcos Maidana – assuming Mayweather beats Maidana in the upcoming rematch, this is a perfect fight for both fighters to try and regain some momentum. Shawn Porter is an aggressive come forward fighter as is Marcos Maidana, would Porter’s chin hold up against Maidana. It’s a fight that a winner is hard to pick but a fight that would give fireworks from the opening bell. 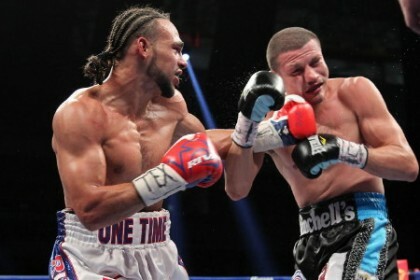 2) Keith Thurman v Ruslan Provodnikov – they both throw bombs with bad intentions, Thurman is the better boxer but this would provide a sterner test than anyone that he has faced before. Provodnikov can be out-boxed as Algieri and Bradley have shown, but he keeps on coming but will he keep on coming with Thurman throwing bombs. It wouldn’t/shouldn’t go the distance but we would learn a lot about both men whilst it lasted. 3) Danny Garcia v Robert Guerrero – Garcia may be a 140 fighter but he won’t be for much longer and will need a dance partner to make him look good on his debut. It would also be a test for Garcia as he has struggled against Herrera and it would give Guerrero the chance to get himself back in to the upper echelons of the division. Garcia should have enough though to win a points decision. 4) Kell Brook v Amir Khan – the new IBF Champion against his British rival, which is a personal rivalry that goes back to amateur days. This is a perfect selling fight for both me, as the animosity is genuine and that does help to sell a fight. Khan looked good against Collazo but Collazo is tailor made for Khan to be quite frank, as he was walking in hands low. Khan to his credit booked sensibly, but questions remain over his chin. Brook has the timing to negate Khan’s speed and the raw power to knock him out. It would be enthralling whilst it lasted but Khan still reverts to macho when he gets tagged which would lead to the end of him against the naturally stronger Brook. 5) Tim Bradley v Lucas Matthysse – Bradley definitely has the boxing skills to beat Matthysse but recently has been trying to fight a more fan friendly style which has led to a close call against Provodnikov and a loss to Pacquiao. An attempt to fight in a similar vein against Matthysse would surely lead him going life and death once again. The key factor here is how many rounds would Bradley be able to get in the bank before he got caught, his survival instincts are arguably second to none as shown against Provodnikov but that’s not something you want to keep on falling back to. Purposely left out any fights for Mayweather, Pacquiao as the only fight we really want to see is them against each other. And if you want to discuss that then there is literally hundreds of articles on it on this and many other websites. One of the fun things about boxing on the whole is the ability to hypothesise fights we want to see. The above fight bar one is not a commonly discussed fight which is something that this article is aiming for to open up the possibilities if the Cold War is truly thawing. Is there any fights which you feel would make entertaining fights in the Welterweight version, do you agree or disagree with the outcomes outlined above? If you want to contact me, please email me at jamiesavin@gmail.com or leave a comment in the comments and I will attempt to get back to you.